Have you even been told to ‘sit down and shut up’? Have you ever been stifled for words? Have you ever lost trust with your partner or workplace/confidant? Chances are, you’ve lost your power; the power to express opinions, suggestions and fears — and ultimately the power to be heard. Michela Quilici, President & CEO of MQ Consulting and Business Training, Inc. was a guest on the Voice America radio show Practical Solutions for Life with host Kathryn Wilking. Michela shares a powerful story about losing her voice and hiding in shame; then, thriving with courage. She’s been on a lifelong journey to reclaim her own voice and influence others to stand up and shine! 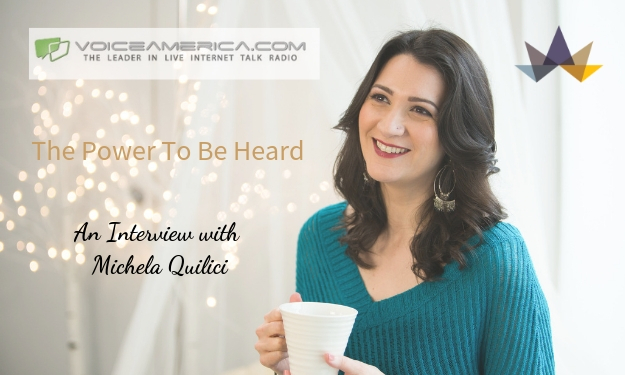 Finding her voice, Michela reveals that it takes great courage and know-how to really own your value and communicate in a way people will “see and hear you”. She talks passionately about ‘Being Seen and Being Heard’ as the most important things you need, in order to live an empowered and inspired life. Are you hiding from thriving? Please join us to hear this amazing metamorphosis from mute to magnificent!